Save time on installations with the easy-to-use graphical Interface, large display, and the intuitive programming. 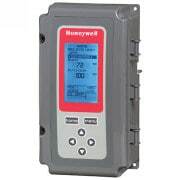 Use the time clock scheduler or digital input to control the setback and disable output options to help save energy. 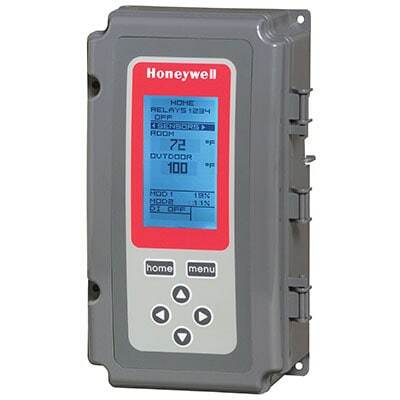 Protect equipment from freezing or overheating on models with the modulating high or low limit control option. Get pinpoint control on modulating outputs by setting the integral and derivative times (PI or PID). Configure models with reset in a few easy steps. Control floating actuators with floating outputs on select models. Eliminate the need for a separate time delay device and protect equipment with the minimum off time option. Sensor 50021579-001 included with non-NEMA 4X models. Sensor T775-SENS-WR included with NEMA-4X models. On/off or analog controller for applications where electronic accuracy and remote sensing of temperature is required.